Spend the 20th (Sat) among aquatic life with a scuba or snorkeling tour. There's much more to do: kick back and relax at Catseye Beach, don't miss a visit to Passage Peak, browse the exhibits of Hamilton Island Art Gallery, and take in the waterfront activity at Hamilton Island Marina. For more things to do, photos, where to stay, and tourist information, use the Hamilton Island vacation maker . Sydney to Hamilton Island is an approximately 4-hour flight. You can also do a combination of train, bus, and ferry; or do a combination of bus, car, and ferry. Traveling from Sydney in April, things will get somewhat warmer in Hamilton Island: highs are around 31°C and lows about 26°C. 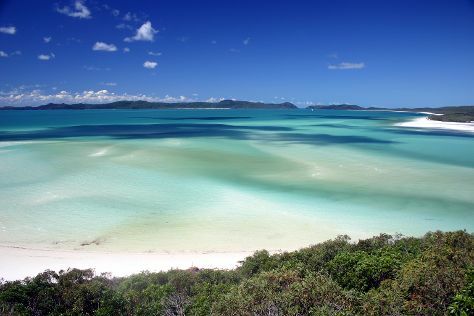 Finish up your sightseeing early on the 22nd (Mon) so you can travel to Whitsunday Island. Start off your visit on the 23rd (Tue): explore the activities along Hill Inlet and then enjoy the sand and surf at Whitehaven Beach. For other places to visit, more things to do, traveler tips, and other tourist information, use the Whitsunday Island itinerary planner . The Route module can help you plan travel from Hamilton Island to Whitsunday Island. Traveling from Hamilton Island in April, Whitsunday Island is a bit cooler at night with lows of 22°C. Finish your sightseeing early on the 23rd (Tue) so you can travel back home.